The Foundation for Global Sports Development today announced the development of a new heavy-hitting documentary short to examine what is widely considered the first act of modern terrorism: the attack at the Munich Olympics in 1972. The film will be called “Munich 1972 & Beyond”. Producers from GSD include internationally recognized sports psychologist Dr. Steven Ungerleider, author of “Faust’s Gold” and “Mental Training;” and GSD President David Ulich, who has worked closely with the American Film Institute and the Annenberg Foundation. Ungerleider and Ulich conceived of the film idea and will be an integral part of the creative and production team. They have 35 years of experience consulting with the Olympic Committee and working on high profile Olympic related cultural activities. The film, scheduled for release later this fall, will explore the terrorist attack on Israeli athletes within the context of a new memorial under construction in Munich, an initiative undertaken by the Bavarian government to bring a sense of closure to this 43-year drama. It will unravel why and how the attack happened, its aftermath, and its importance in 2015 and beyond. A theatrical release is planned along with a wide educational distribution and ultimately global television partners around the world. GSD has partnered with Director Stephen Crisman, whose credits include documentaries for A&E, MSNBC and “60 Minutes,” and Executive Producer Michael Cascio — four-time Emmy winner and former programming chief at National Geographic Channel, as well as A&E, and MSNBC — to bring new research and information to the film, exclusive interviews and fresh perspective in the midst of ongoing headline-grabbing terrorist attacks such as Charlie Hebdo. Dr. Steven Ungerleider and David Ulich serve as executive board members to GSD. Both have worked closely with the Olympic movement for many decades. Dr. Ungerleider has written several books on Olympic topics, including the best-selling “Faust’s Gold: Inside the East German Doping Machine,” which examined the 30 year doping activities of the late East German regime and was made into an award winning film. Ulich and Ungerleider have designed prevention-based programs for youth at risk including a mentorship outreach taking youngsters to the Olympic games. Working closely with international sports federations, generous donors and committed athletes, The Foundation for Global Sports Development promotes sportsmanship, education, fair play and ethics among the world’s youth. The Foundation gives special emphasis to groups and communities that are most in need or most underserved by current programs, including women, minorities and youth in areas where the risk of delinquency is particularly high. Visit www.globalsportsdevelopment.org to learn more. Goal Setting Read our blog on goal setting. Angela Madsen is a woman of many talents, including rowing, discus, motivational speaking, engineering, and especially connecting people to a particular cause or goal. When Ready, Set, Gold! sent us their nomination for Angela, we knew right away she would be one of the recipients for our Athletes in Excellence Award. While serving in the United States Marine Corps, Angela sustained injuries to her back which caused her to be discharged from service. Angela went on to become a mechanic, study mechanical engineering and landed a job in her field. However, her injuries became increasingly debilitating, and in 1993 she underwent surgery to repair the damage. She thought within a year after the surgery, she would be walking and surfing. The surgery went horribly wrong. After 11 hours on the operating table, having the wrong disc removed, the wrong hardware implanted, and unnecessary drilling into her spine, Angela was left paralyzed. In the process of her recovery and waiting for financial assistance from the VA, Angela lost her job, her home, and all hope. She was living in the parking lot of Disney Land and storing her valuables in the lockers of the theme park. The next several years were spent living day-to-day, as she maneuvered through her new life as a paraplegic. She experienced another life-changing injury when she landed head first onto some train tracks after her wheelchair had become stuck in a crack. As she began to heal from this injury and regained feeling in her hands – the nerve had been affected from the damage to her neck in the fall – Angela realized she still possessed great ability and still had so much more to lose. From there she held a new appreciation for the life she had. In high school Angela was voted “Most likely to become an Olympic athlete.” While she certainly had lost that dream after her injury and botched surgery, slowly that prophecy began to take a new shape. After attending the Veterans Wheelchair Games for two years, in 1997 Angela competed on both men’s and women’s team as a Division I athlete. The next year Angela began rowing, and from there her athletic success launched her onto a completely new path. The list of athletic achievements below do not even come close to painting a full picture of how Angela has changed her own life – and the lives of many others – with her passion for sport. She used her background in engineering to “properly rig boats and position adaptive fixed seat rowers in boats so they could safely participate in the sport.” From this innovation Angela founded the California Adaptive Rowing Program (CARP), which provides instruction and training for competitive and recreational opportunities in the sport of rowing to physically and intellectually-challenged individuals. If anything, Angela is fueled by challenge and positive change. This is evident in her long-distance rowing challenges. She most recently rowed from Long Beach, CA to Hawaii with Tara Remington of New Zealand. The pair spent two months on the Pacific Ocean, traversing over 2,500 miles without a support boat – all to raise money for CARP. Angela is no stranger to this kind of long-distance rowing, as she accomplished similar feats each year in 2007, 2009, 2010, and 2011. In 2008 and 2012, she was dedicated to training for the Paralympics. We hope you will join us in continuing to follow Angela and her rowing adventures. Her dedication to sport and the community of adaptive sports is incredible, and we are honored and humbled to welcome her into our inaugural class of Athletes in Excellence. Congratulations, Angela! Of our many new initiatives, the annual Exceptional Youth Scholarship program is one we are most excited to share with our followers. Our new scholarship program recognizes youth who have demonstrated remarkable conduct through community service efforts, volunteerism and mentorship activities, in addition to achieving outstanding academic performance. We are looking for ten high school juniors and seniors who have a passion for community service, a thirst for knowledge, and plans to attend a four-year college or university. The ten finalists will each receive a one-time scholarship of $5,000 to be applied towards cost of attendance including tuition, housing, books and other on-campus related expenses at accredited, four-year colleges and universities in the United States. 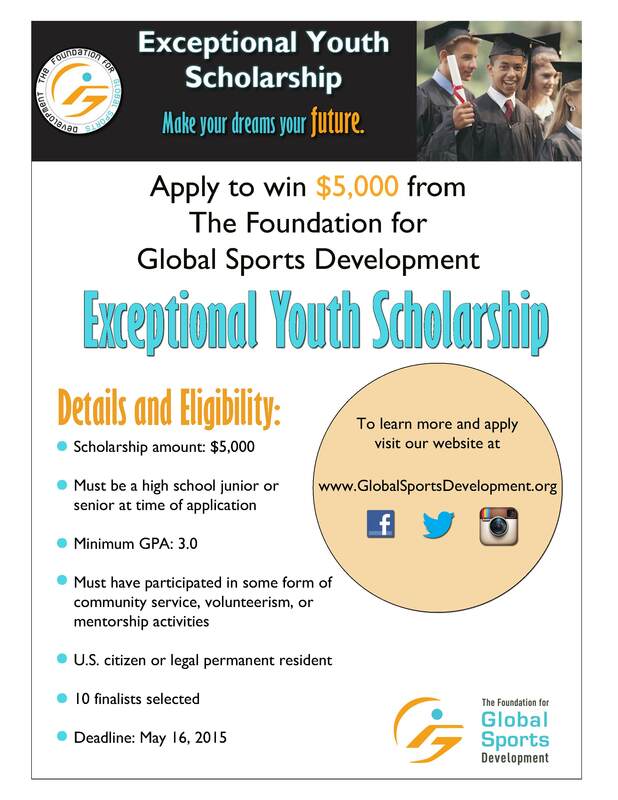 The deadline to apply for the 2015 Exceptional Youth Scholarship is May 16, 2015. Click here to apply. In 500 words or less, describe a personal experience (challenge, achievement, community service experience, and ext.) that has helped shape you into the person you are today, and the person you strive to become. We encourage you to share this scholarship with high school students in your life. Here is a flier you may download, print for display, or email to anyone who may be interested. Download or share this flier with students or parents who may be interested in the scholarship! Soccer – Can we End the Silence on Violence? Stand up and get kicked off the field! Soccer season is in full swing – literally! My daughter, a soccer player who was out of the game due to a mild concussion injury, wanted to support her team in a game against a school in LA. We arrived at the game just around half-time because of LA traffic. My daughter ran out to join her teammates in the halftime circle on the field and forgot to bring a jacket. It was a nippy night, so I got a jacket out of the trunk of the car. After I parked the car, I walked over towards the team to bring my daughter her jacket and couldn’t help but hear the opposing team coach screaming at her team. I overheard her say things like hurt them and hit them and started to wonder what in the world are these coaches saying to our girls? The screaming coach also accused our team of doing anything to win like throwing elbows and kicking players. I stood there shocked and in disbelief. What is the price of victory? Violence? When I saw another coach leave the huddle of hatred and walk over towards the 50 yard line to go into the score box, I asked him his name and told him he was a witness to the violent attitude permeating from the screaming coach. As I walked back across the field, I passed the Referee’s who were in the middle of the field still waiting for half-time to be over. I told them I was concerned about the safety of the players had and asked where I could file a complaint. They told me to speak to the Athletic Director (“AD”). I then left the field and tried to find the AD. I was told he was there earlier, but no one knew whether he was still there. The game commenced and I started watching. A few minutes later, our team coach came over to me and asked me to leave the field because the opposing coach had complained about me. I was again in disbelief. I was threatened and told to leave the game simply because I wanted to file a complaint about a coach perpetuating violence? I told our coach that I would leave and then walked away. On my way out, I finally found the AD told him what I had overheard. As I left the game, I thought about what I had witnessed on the field this past season. After one game in Santa Monica, one of our players showed me and her mother the black and blue marks on her legs that she had gotten on the field that day. I also remembered the time my 11 year old was punched in the face by another 11 year old club soccer player. That player was red carded and asked to leave the game. Now I was asked to leave the game? My crime, overhearing a screaming coach and wanting to stop the circle of violence. On my way out, I made a vow. The silence on violence must end. Our world needs everyone to speak up, share their stories and be safe. If you witness a Coach screaming at players and urging violence what will you do?